As a youngster, Richard spent much time trekking through the unpopulated hills of Orange County, California, drawing and painting landscape and wildlife. While other boys his age chose sports figures for their heroes, he chose to emulate John James Audubon. By the age of thirteen, his first painting had been sold. During the next twenty years, Richard’s career earned him over twenty-five national awards, including the prestigious Belding Award and the coveted First award from The Art Directors Club of New York. 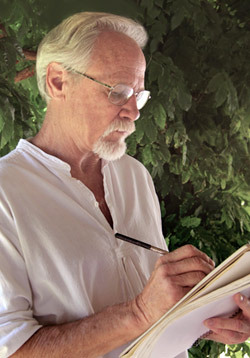 In addition, he is an award-winning signature member of the National Watercolor Society and the Colored Pencil Society of America, as well as winner of the Top 100 Arts For The Parks international competition and numerous other fine arts competitions. 25 National awards for advertising design, four-time Belding Award winner, and First awards from The Art Directors Club of New York from 1965 to 1990. Award-winning signature member of the National Watercolor Society. Selected for Top 100 Arts For The Parks 1996.